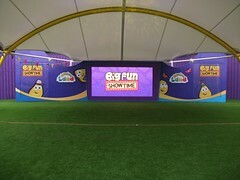 Some of CBeebies' biggest names take to the stage as part of Big Fun Showtime, in the park's outdoor activity centre. Pull up a deckchair and chill out on the luscious green lawn that surrounds the stage and before you know it you'll be enjoying one of the various shows that take place in the Big Fun Showtime arena. The arena is open to the elements and whilst the stage itself is sheltered under a canopy, the audience can sit out in the sun as the shows can be seen all across the area. Various shows take place in the Big Fun Showtime arena throughout the day and it is well worth checking the show boards to see what is going on when you visit. Whilst the arena itself was a brand new facility when it open in 2014, the site it is constructed on has a long history as an entertainment venue as it was formerly the site of the park's Ice Arena. For many years the Ice Arena was located in Storybook Land and was best known as the home of Peter Rabbit. In recent years the Ice Arena stood empty and gradually fell into disrepair as the park's entertainment offerings were focused elsewhere on park. As of 2014 the Ice Arena has now gone and has been replaced by the Big Fun Showtime arena, with the entrance to the new venue located where the Ice Arena's fire exits used to open out into Old MacDonald's Farmyard. Say eh-oh to Tinky-Winky, Dipsy, Laa-Laa and Po and enjoy a concert by the hottest band in Tellytubbyland. After each show the Teletubbies will be on hand to meet and greet their young fans. Big Fun Showtime is a perfect spot for picnic, so join Bing and Flop as they take a break from their day out at Alton Towers. Once the blanket is laid and all their guests arrive there's sure to be a whole host of fun and games to enjoy. Duggee and his friends love a big day out and everyone has prepared their bags ready for the trip but now it's up to Happy to work out whose bag is whose. If you help Duggee and Happy complete their to do list you might just earn your very own Big Day out Badge. In between shows, why not enjoy the Funsters' games and activities? A series of challenges can be found in and around the colourful tents in the arena. Igglepiggle and Upsy Daisy love spending time at Big Fun Showtime and can often be found having meet & greet sessions in their blue and yellow tent alongside the Funsters challenge area. Tree Fu Tom has leaf boarded into Big Fun Showtime in search of his missing backpack, which has been taken by the mischievous Mushas. Tom has been joined by Ranger Sam but they might need the audience's help to join in with some real life Tree Fu Magic. The Zingzillas brought their Zingtastic Tour to the Big Fun Showtime each year from 2014 to 2016. Everyone's favourite primate band travel in style and had their very own tour bus that let them perform throughout CBeebies Land before taking to the Big Fun stage with tunes that were sure to have you dancing along before you know it. It's Mike's Birthday and he's decided to celebrate it at Big Fun Showtime. Evie would like to make Mike a Birthday treat but she'll need the audiences help to carry out the spells she needs. Not content with having their own Science Lab at the park, the Neurons brought a bit of science to the stage with Nina's special helpers, Nick and Nat. After all there are some experiments that are just too exciting to be confined to the lab! Mike the Knight also ran a Knight School to train any would-be knights in the audience to help protect the Kingdom of Glendragon. Here you could learn to cast spells at Evie's Wizard Workshop, take aim with Mike's Target test or hunt for precious dragon eggs to show off the new skills you'd gained. During February Half Term 2015, Mr Bloom came to Big Fun Showtime with an exciting live show where he invited tiddlers to join him in his nursery. The second weekend of the Half Term also saw Justin Fletcher take to the stage.